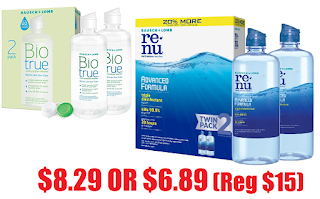 2 Bottles of 12oz Bausch + Lomb ReNu Contact Lens Solution $8.29 (Reg $15) + Free Shipping or $6.89 With 5 Amazon Subscribe & Save Discounts, 2 Bottles of 10oz Biotrue Contact Lens Solution Soft Lenses $10.18. Also Click here for the complete list of all the cheapest price Subscribe & save items on Amazon. Great prices and also great items to add to get to 5 discounts on the month and the 15% off.